OK, I don’t think words or pictures can describe the entity of Varanasi. We stayed at a guest house ran by an Indian family who were very welcoming. We ate authentic Indian family cooked meals which were really good, enjoyed chai Marsala tea which was delicious. All sounds super cool right? Right. All was good… the first morning we went on a sunrise boat trip down the Ganges, captain of the ship Babu- a nice and friendly guy. We then saw the multi uses of the Ganges, such as kids swimming lessons, yoga classes, locals washing their clothes, people praying, fishing… Couple this with cremations of bodies, garbage, and a floating baby arm*! It was hard to understand how people were drinking and bathing in the water. The Ganges, so respected and spiritual was at the same time cluttered with litter- and done on purpose with the ‘cleaners’ just sweeping garbage in the the river. It all seemed a little contradictory to say the least. That aside watching the sunrise rise on our little row boat was definitely the highlight of Varanasi, we saw some amazing views. You can really see the spirit of the Ganges in the people who celebrated the long river in so many ways. With the sun beating down (46 degrees! ), we walked to the city centre. As a white couple in India many people (not all- we have met some lovely people) just see walking money and just expect you to hand it over. One man came up to me and said his aim was to talk to foreigners and make friends, “OK great let’s talk” can you give me a 100 rupees. Another man called us “cheap rich folk” as we didn’t just give our money away… Its strange as on a few occasions it seems people are interested in sharing their culture , beliefs and history but when it comes to saying good bye, they say “tip” … By no means have we not tipped, bought children food and drink but there is no tally, there is no record and everyone expects it, where does it end? On our final day in Varanasi we hit our first low day. The overnight train to Agra we booked over 3 weeks ago didn’t come through. We were stuck on a waiting list, leaving us stranded in what we can only imagine has to be the craziest train station in the world. We ended up having to stay another night and booked a flight for the next morning to put us back on track. It wasn’t all doom and gloom, but we’d be lying if we said it was easy going. 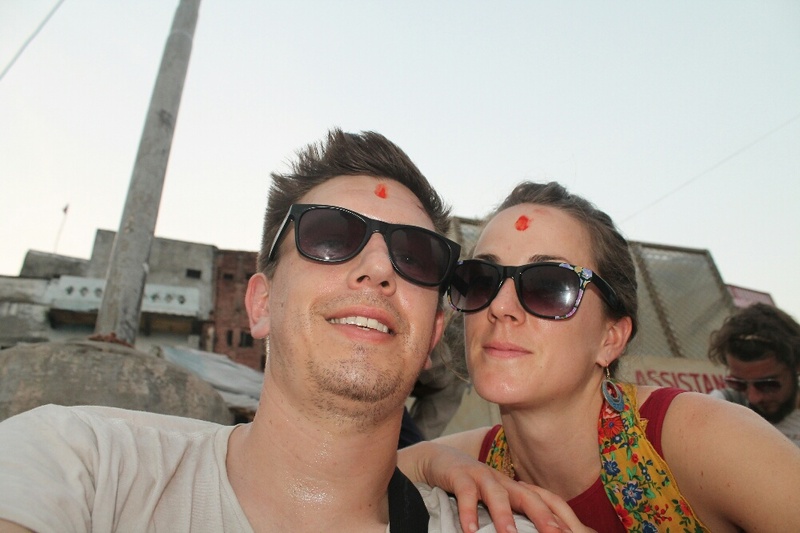 In retrospect we totally booked too many days in Varanasi. One or two nights would have sufficed. We are in Agra now, which seems to be a totally different type of city. Cleaner and less hectic but this will be a different post. * From what we understood, when bodies are cremated one of their body parts, or organs are thrown into the Ganges unburned. In the case of ‘pure’ bodies, such as babies, pregnant women, etc. their bodies are not burned. Instead, a weight is attached to their bodies and they are put into the middle of the river in full tact. I believe this is why we saw a babies arm. Perhaps it was detached after being in the river for as while? We can only speculate and allow you to do the same. Posted on June 9, 2014 June 11, 2014 by themussmarter	This entry was posted in General MussMart News, India. Bookmark the permalink. We are very envious. Oh to be young again!!!!!! Truly amazing! Thank you for sharing!